Nadine Bernacki, Dave Carson, Erik Coverdale, Beatrice Ekoko, F. Ross Englefield, Jeffrey Ponsford, Pauline Prowse, Bill Thompson, Patti Turnbull. Congratulations to all elected members, and kind thanks to those who supported them. Since inception in 2012, HARE has had many accomplishments. We created our Mission and Vision to promote renewable energy in Hamilton. We have reviewed opportunities in this area through a partnership with the Green Energy Co-operative of Ontario (GECO). We incorporated as a Non-Profit in September 2012 and have since grown to our membership to over 70 individuals. We have created (and now passed) our bylaws for the Corporation and have hosted our first Annual General Meeting. We are now eager to explore new areas and to listen to our membership and citizens of Hamilton for great ideas for 2013 and beyond. Our keynote speaker for the event was Tom Chessman, Vice President of Hamilton Renewable Power Inc. and Manager of Energy Initiatives for the City of Hamilton. 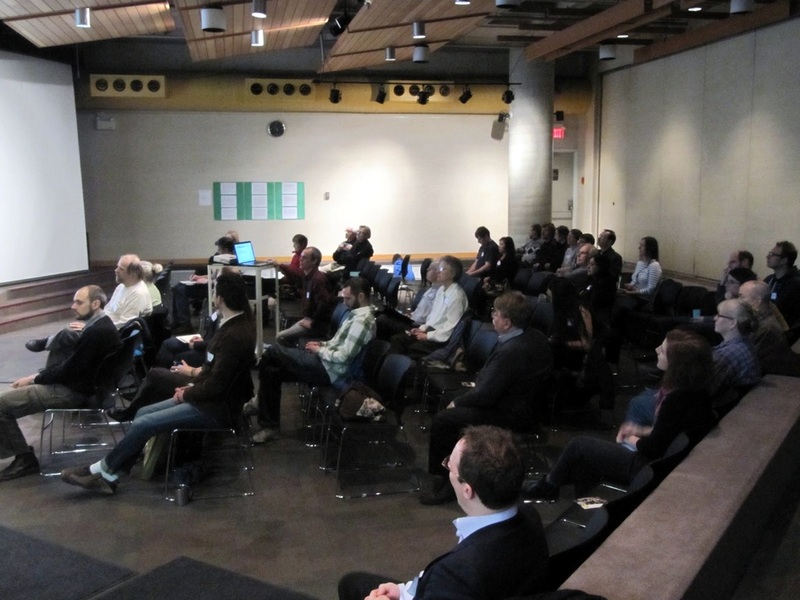 His excellent, and often eye-opening, presentation covered several of the incredible works in renewable energy and energy conservation going on throughout the City of Hamilton. Mr. Chessman explained that the current successes began as a Council Mandate in 2005, moved relatively slowly through the Office of Energy Initiatives creation in 2006 to the Corporate Energy Policy and Energy Commodity Policy in 2007. Since then, the effort has steadily gained momentum. The slate of ongoing, future and completed projects is truly impressive. These include efforts in heating, cooling, lighting, water conservation, waste water management and renewable energy. The City has created various District Heating and Cooling Loops. These use a ‘pooling’ concept to allow multiple nearby buildings to share heating and cooling systems. This results in the option for higher-efficiency units and a much greater efficiency in energy use. Chessman’s team continually monitors these facilities to find further efficiencies as well as ways to expand and duplicate the efforts in other areas of the city. Through subsidies and incentives, energy-efficient lighting retrofits have become an excellent opportunity. Projects have now been completed in libraries, arenas, fire stations, the Wentworth Operating Centre and Hamilton Convention Centre. Due to the significant increase in energy efficiency, these retrofits pay for themselves very quickly, and create a sort of ‘green profit’ afterwards from the energy and cost savings. 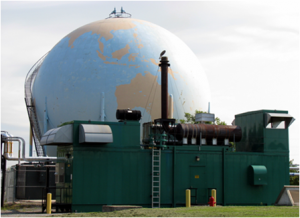 Both energy efficiency and power production are occurring at the Wentworth Wastewater Treatment Plant. The City installed energy-efficient pumping systems to reduce energy costs. Through the award-winning bio-methane facility, Hamilton is able to convert methane, a waste product of the water treatment process, to Natural Gas for sale to Union Gas. From the renewable energy pilot partnership with Horizon Energy, further district energy projects, efficiency monitoring and automation systems, it is clear that the City is embracing as many options as possible and providing world-class solutions. They report that since efforts began in 2006, the City has saved an accumulated total of $27-million in energy savings and avoided costs. These efforts have resulted in energy consumption for 2012 being 14% lower than in 2005. There are many projects planned for 2013, and the above does not cover all the excellence that is already occurring. Stay tuned for more posts on the City of Hamilton’s efforts. 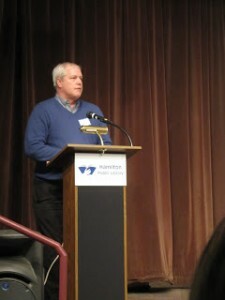 Following Tom’s keynote, Kevin Epp from GECO provided an update on their efforts. HARE wasn’t the only renewable energy community group that partnered with GECO. They also connected with partners in Halton Region, London, Durham Region, Wellington County, Oxford County and Chatham-Kent. There are now a total of 504 members in GECO across all these areas, with 70 in Hamilton. The numbers and diversity both provide a very stable base for GECO and renewable energy projects in Ontario. The FIT 2.0 window closed on January 18th, 2013, and on behalf of all the GECO partners, submitted 12.9 megawatts of project proposals. 1.5 megawatts of these are in Hamilton. With all submissions now in the hands of the Ontario Power Authority (OPA), we now will wait for about 4-6 months while they decide which of the submitted proposals will earn an OPA contract. ‹ See you at the FGM this Sunday, Jan 27th! Great work Ross! You really are so great at this!